A small group of Western District pioneers join Passing of the Pioneers this month. Among them are immigrants from Scotland, England and Canada and, as usual, each have an interesting story. Their names have now been added to the Western District Families Pioneer Obituary Index. 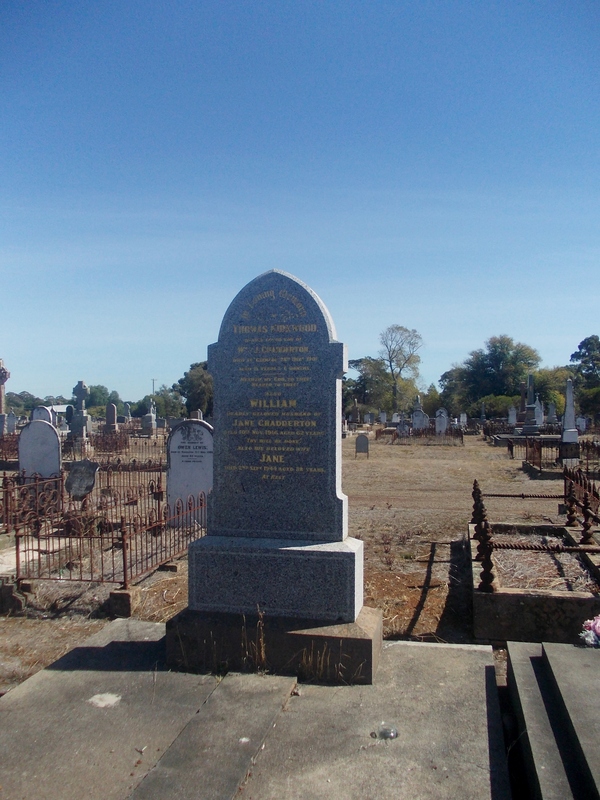 Peter DALLIMORE – Died September 1901 at Warrnambool. Peter Dallimore was born in New Brunswick, Canada around 1842. His father Captain Joseph Dallimore was born at the Isle of Wight in 1805. He went to North America and married Mary Smith of Philadelphia. The settled at St. Andrews in Charlotte county, New Brunswick, Canada where Peter was born in 1842. In 1850, Mary Smith died. Peter arrived in Australia and went to the Warrnambool district in the late 1860s. He married Marianne Meek on 15 March 1870 at St. James Cathedral in Melbourne. “Family Notices.” The Argus (Melbourne, Vic. : 1848 – 1957) 19 Mar 1870: <http://nla.gov.au/nla.news-article5815488&gt;. 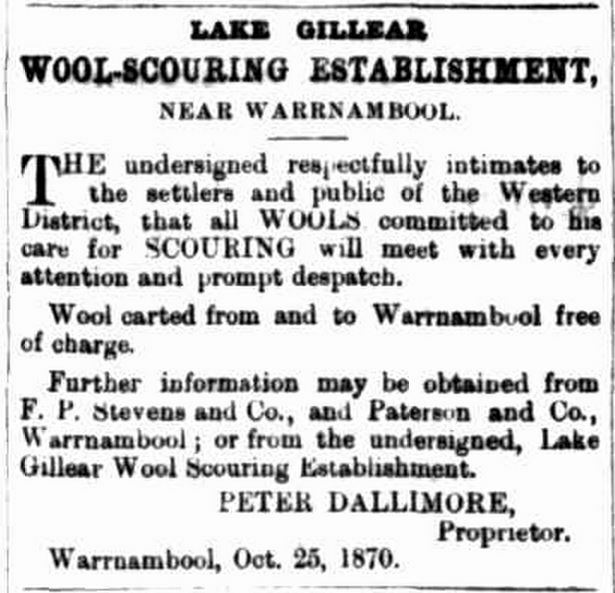 Peter set up a wool-scouring business on the banks of Lake Gillear near Allansford. “[No heading].” Hamilton Spectator (Vic. : 1870 – 1873; 1914 – 1918) 21 Dec 1870: 1. <http://nla.gov.au/nla.news-page22231123&gt;. In 1876, father Joseph Dallimore arrived to Victoria aboard the Macduff. He died at Warrnambool in 1878 and was buried at the Warrnambool Cemetery. In the 1884, when journalist The Vagabond was touring Victoria, he called in on Peter Dallimore. I feel that he may have crossed his wires, thinking Peter was a “native of the Old Dominian”…Virginia. Peter was from Charlotte County in New Brunswick in Canada. There is also a Charlotte County and a Brunswick in Virginia and no doubt Peter had a North American accent further confusing The Vagabond. “PICTURESQUE VICTORIA.” The Australasian (Melbourne, Vic. : 1864 – 1946) 10 Jan 1885: 43. <http://nla.gov.au/nla.news-article137597580&gt;. Peter Dallimore was buried in the Warrnambool Cemetery with his father and wife. I have the Cemeteries of the S.W. USB that includes the Warrnambool Cemetery and a photo of the Dallimore headstone. It is very informative and includes a memorial to Peter’s mother and all dates and places of birth. George MARRINER – Died 7 September 1911 at Colac. George Marriner was born in Fulham, London around 1833 and arrived in Australia around 1857. George was a nurseryman and established the Fulham Nursery in Colac. He was also a founding member of the Colac I.O.O.F. In 1908, George’s wife Elizabeth was sitting by the fire in their home when her clothing caught alight. George, in his mid-seventies, returned to the room and tried to douse the flames but to no avail. Elizabeth died from her burns. At the time of George’s death he had three sons and a daughter. Thomas STAINSBY – Died 26 September 1914 at Warrnambool. Thomas Stainsby was born in Melbourne in 1848. He went to Warrnambool and worked as a bootmaker and lived on Raglan Parade. Thomas took a keen interest in all sports in Warrnambool but cycling and pedestrianism where his preferred sports and was a handicapper for both. He was also a sergeant in the Volunteer Militia and was involved with the Church of England men’s society. Thomas had a shop in Fairy Street, Warrnambool and rode his bike each day from his home in Raglan Parade. On the morning of his death, he rode to work as usual but on his return home around lunchtime, he collapsed off the bike and died soon after. As two of Thomas’ sons were members of the Warrnambool Brass Band, the band did not play at the Saturday afternoon football or the evening pictures on the day of Thomas’ death. Ellen MAY – Died 27 September 1914 at Ecklin South. Ellen May was born in Berkshire in 1834. She arrived in Australia in 1857 aboard the Sir William Fyre and in 1860 she married George Rodgers at Ballarat. Their first child was born at Smythesdale in 1861. During the early years of their marriage, George tried gold mining around the Haddon area and operated a grocers at Speciman Hill. Eventually, they selected land in the Heytesbury forest, near Cobden and named their property Sunny Banks. Ellen and George had seven children and one of those, Ellen Matilda Rodgers married my 1st cousin 4 x removed, Arthur John Harman, in 1891. Arthur was a son of Jonathan Harman. John Hutchinson MURRAY – Died 23 September 1935 at Glenthompson. John Murray was born at Brighton in 1873 to William Murray and Harriett Hutchinson. William Murray was the owner of Brie Brie near Glenthompson and had resided there since 1869, breeding fine Merino sheep. When John was twenty-two, he built a golf course at Brie Brie, after playing the game in Scotland. It was one of the first private golf courses in Victoria. James Patrick DEVLIN – Died 4 September 1942 at Portland. James Devlin was born at Cape Bridgewater in 1858. He first worked for John Thomas Edgar at Kadnook near Harrow, then moved to Edgar’s station Thackaringa near Broken Hill. At Broken Hill, James caught the mining bug and prospected first at Broken Hill and then Kalgoorlie where he spent thirty years. He was manager of several different mining ventures while in Kalgoorlie. James was also associated with Sir Sidney Kidman, possibly during their time in Broken Hill, and was good friends with Thomas Browne aka Rolf Boldrewood, author of “Robbery Under Arms”. In 1891, James married a Portland girl Kate Duffy and they had two children. In 1908, James returned to Portland residing in a property at North Portland until his death. Jane KIRKWOOD – Died 2 September 1944 at Hamilton. Jane Kirkwood was born at Hamilton in 1856, the daughter of Scottish immigrants, William Kirkwood and Jane O’May. The Kirkwoods lived at Buckley Swamp. In 1885, Jane married William Chadderton and they settled at Glencoe near Bochara. William was a renown breeder of Jersey cattle. After William’s death in 1916, Jane moved into Hamilton to live until her death in 1944. She was buried at the Hamilton Old Cemetery. Jessie Cairns SPALDING – Died 25 September 1944 at Cobden. Jessie Spalding was born in Scotland in 1861. As a baby, she travelled with her parents to Australia, arriving at Geelong. They then went on to the Ballarat diggings. 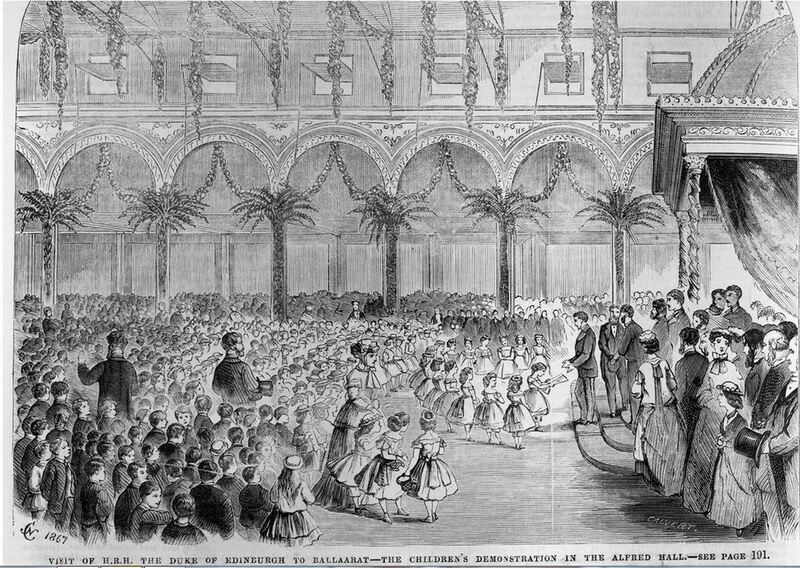 From her time at Ballarat, Jessie recalled the visit from the Duke of Edinburgh in 1867 as depicted in the engraving below. When Jessie was eighteen, she moved to Camperdown where she met Thomas Fletcher. They married and raised a family of ten children. One son was killed fighting during WW1. At the time of her death, Jessie had thirty-five grandchildren and forty great-grandchildren. This entry was posted in Pioneer Obituaries and tagged Dallimore, Devlin, Kirkwood, Marriner, May, Murray, Spalding, Stainsby. Bookmark the permalink.